Usain Bolt of Jamaica as he races to victory in the men’s 100-meter semifinal at the Rio de Janeiro Olympic Games on Aug. 14, 2016. Usain Bolt bolting across the finish line during Sunday's men's 100-meter Olympic semifinal with a smile on his face has spawned a hilarious meme. 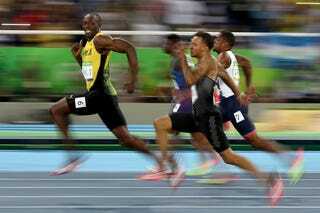 Bolt realized he was steps ahead of the other runners and gave Getty Images photographer Cameron Spencer a viral photo to beat all photos. And speaking of Justin Gatlin, Bolt went on to beat Gatlin, his biggest competitor, at Sunday’s Olympic men's 100-meter final in 9.81 seconds, winning his third gold medal in the event.